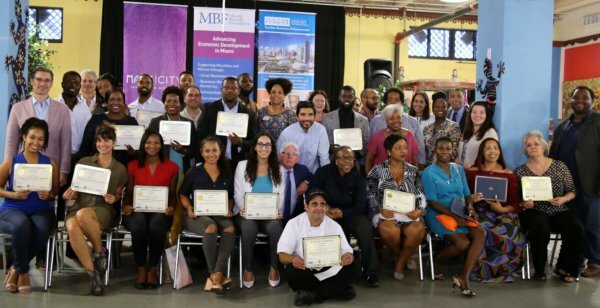 Miami, FL (August 16, 2018) – Little Haiti, Fla. – On August 16, 2018, MBF celebrated the graduation of 23 City of Miami small business owners from its 8th Small Business Training. Sponsored by the Magic City Innovation District Foundation, the Greater Miami Convention & Visitors Bureau and Little Haiti Cultural Club, this 5-week, 10 session program is offered to minority-owned businesses in the City of Miami who are ready to take their business to the next level. Here, they have the opportunity to sharpen their entrepreneurial skills while learning how to prepare to access capital. The series of workshops, which are taught by experts in the field, provide business owners with essential tools and skills to grow their companies including contracts, budgeting and cash flow, branding, digital marketing, etc. The Small Business Training is made possible thanks to sponsors like the Magic City Innovation District Foundation and the Greater Miami Convention & Visitors Bureau. The mission of the Magic City District Foundation is to increase opportunities and promote progress and prosperity for the residents of Little Haiti, the surrounding community and greater Miami in general. The Magic City Innovation District Foundation is dedicated to giving back to the local community and invests in the mission of organizations like Miami Bayside Foundation’s Small Business Training because of their mission to provide business owners with the tools to grow and help the Little Haiti neighborhood to prosper. Similarly, the Greater Miami Convention & Visitors Bureau (GMCVB) through the efforts of their Multicultural Tourism & Development Department serves as a catalyst for capacity building in efforts to expand the reach of the tourism dollar throughout Miami Dade’s diverse and vibrant neighborhoods. Miami Bayside Foundation (MBF) is a nonprofit organization designed to advance economic development in Miami through the support of minority businesses and education. MBF seeks to do this through the creation and administration of loan programs for minority businesses, through the creation of programs and educational scholarships for minorities, and by providing technical assistance to minority-owned businesses. The MAGIC City Innovation District Foundation is a charitable fund at the Miami Foundation, a 501(c)3. It provides funding and support to programs that benefit the local community and facilitate growth in partnership with community leaders, activists, organizations and government entities. The organization’s mission is to enhance the Little Haiti and greater Miami community and the lives of everyone who lives and works in Little Haiti and beyond. As Miami’s official destination sales and marketing organization, the Greater Miami Convention & Visitors Bureau’s mission is to attract, encourage and entice all persons and organizations to visit Greater Miami and the Beaches for conventions, business and pleasure. Acting on behalf of its partners and the citizens of Miami-Dade County, the GMCVB markets and promotes all segments of the community as a preferred destination. In furtherance of this mission, the GMCVB supports and encourages actions and programs that enhance the desirability and attractiveness of Greater Miami and the Beaches for its visitors.